Aquathin's Classic RO-DI Traveler. The most beneficial traveling accessory you will ever own. 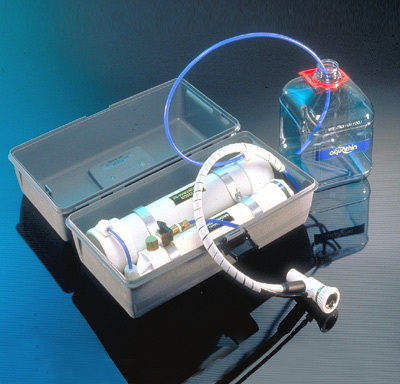 Aquathin manufactures the only REVERSE OSMOSIS PLUS DEIONIZATION unit on the market. Specially designed to remove salt, heavy metals, chemical pollutants, pesticides, nitrates and disease causing waterborne micro-organisms. Aquathin's ASTRO-Traveler, perfect for recreational vehicles and motels. Guaranteed pure water wherever you go. Easily stored in briefcase or suitcase. Please click the Product Catalog button below for more information on Aquathin's Classic RO-DI Traveler and Aquathin's Astro-Traveler.